William P. Houghton married Thelma I. Patterson in Dec 13, 1941 at Plessis, NY, USA. Jennie (?) married Gary Houghton, son of Hiram Houghton and Helen Maria Collins, in circa 1926 age 52 and 48. Francis Houghton married Marcella (?) in circa 1927 age 24 and 18. Marcella (?) married Francis Houghton in circa 1927 age 24 and 18. Michael F. Houghton married Josephine Maroney in circa 1901 age 28 and 20. Josephine Maroney married Michael F. Houghton, son of John Houghton and Mary Radigan, in circa 1901 age 28 and 20. Gertrude Houghton married Charles A. Shaub. Julia V. (?) married Charles Frederick Houghton, son of John J. Houghton and Julia (? ), in circa 1904 age 23 and 21. Matthew R. Houghton married Ruth Evelyn Goodwyn in Jun 7, 1932 at Brooklyn, Kings Co., NY, USA. 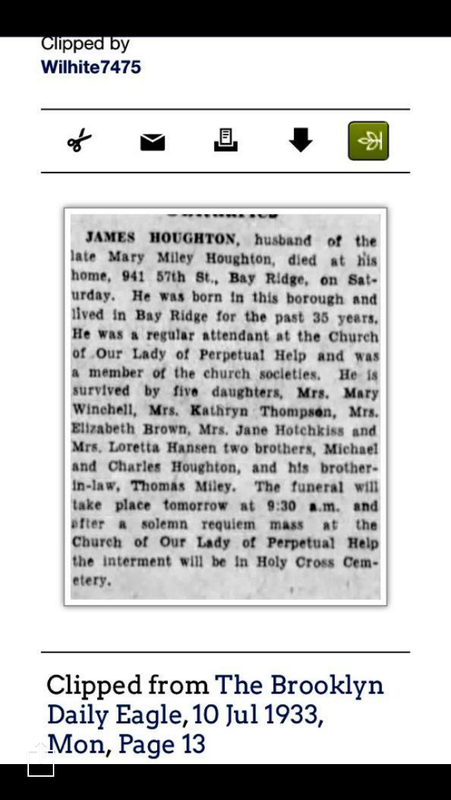 James J. Houghton married Mary E. Miley in Feb 24, 1884 mar 17 years in 1900 census. Elizabeth Houghton married Robert A. Brown in Jun 25, 1913 at Brooklyn, Kings Co., NY, USA, age 23 and 22. Robert A. Brown married Elizabeth Houghton, daughter of James J. Houghton and Mary E. Miley, in Jun 25, 1913 at Brooklyn, Kings Co., NY, USA, age 23 and 22. Alfred F. Houghton married Frances (?) in circa 1904 age 42 and 35. Frances (?) married Alfred F. Houghton in circa 1904 age 42 and 35. John T. Brady married Annie Houghton, daughter of (?) Houghton, in circa 1921 age 23 and 21. Annie Houghton married John T. Brady in circa 1921 age 23 and 21.